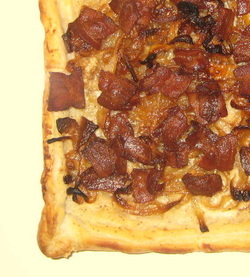 Onions, bacon, and a puff pastry. How can this be bad?? Well, it's not, but the recipe as I followed it the first time calls for way too much prep time. I made it the first time pretty close to the recipe, but check out the notes for where you can save some time and energy. Definitely something I will try again, but with process improvements. Mix wine and honey and toss the onions with this mixture and set aside. Cook bacon until crispy and drain. Mix bacon drippings into the onions, spread this on a baking pan and roast in the oven at 375 for about an hour. This is what I did the first time, but please look at the notes below for next time. Mix the creme fraiche and nutmeg. Roll out the puff pastry to that it's fairly thin. Then fold the edges over a bit and tamp it down with a fork. This makes a boundary for the tart. Spread the creme fraiche on the bottom, spread the onions out over and then top with bacon. Bake at 400 degrees until the puff pastry gets, well, puffy and golden brown. Tossing the onions in the honey/wine mix really gives the onion a mellow sweetness, so I'll definitely do that again. However, I'm going to cook the onions in the bacon drippings on the stove. Roasting the onions 1) took way too long (at least an hour) and 2) used a lot of oven energy 4) adds another dish to wash, and 5) just didn't give a "yowza-that's-great-and-worth-the-time" taste return vs. time spent. Cooking the onions on the stove will turn 1 hour of prep to 10-15 minutes, tops. It also makes sense not to carmelize the onions completely or to super crisp the bacon. Since it goes in the oven for another 30 minutes after cooking, if the onions are a little less than carmelized, and the bacon a little bit soft, it'll be perfect when they come out of the oven. (You can see the the bacon and onions in my first attempt are on the dark side). Next, I'm going to cut the puff pastry into 9 squares and use a muffin pan to make little tartlets so that the ratio or puffy/crunch pastry to onion/bacon/creme fraiche is better. If you eat a center piece of the tart, you miss the puffy crunchy goodness altogether.